The Pamlico is located on the southeast front corner of the Cypress House. Bask in the morning sun as it rises from the east. Partial ocean views give you a glimpse of the ocean's mood for the day. White cane chairs give a nook for reading. Windows on two sides give way for a cross-breeze of the ocean air. 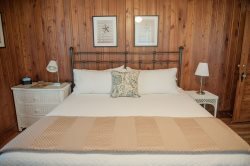 Queen Bed, Private Bathroom, Central A/C, Flat Screen Cable TV, Wireless Internet, Micro Fridge, Ceiling Fan, Hair Dryer, Iron Available.